Former WWE RAW and NXT Tag Team Champions AOP (The Authors of Pain) could very likely be drafted to the SmackDown Live brand in the days to come. On an edition of WWE Now, Kayla Braxton and Cathy Kelley discussed the ongoing WWE Superstar Shake-Up, with Braxton asserting that there have indeed been rumors pertaining to the return of AOP. Additionally, Braxton alluded that AOP -- comprising hulking Superstars Akam & Rezar -- could end up moving from Monday Night RAW to SmackDown Live. The Authors of Pain aka AOP (Akam & Rezar) are former NXT Tag Team Champions who made their main roster debuts last year, and eventually went on to win the RAW Tag Team Championship. Initially managed by Paul Ellering on NXT, following AOP's main roster debut, Drake Maverick began assisting them and working as their manager, as Ellering was removed from the equation. AOP lost their RAW Tag Team Titles in a 3-on-2 Handicap Match where Akam, Rezar and Drake Maverick faced the team of Bobby Roode and Chad Gable -- with Maverick being pinned and thereby costing AOP the titles. The Authors of Pain last competed on-screen back in December of last year, and have been on the shelf ever since, owing to Akam having to deal with a knee injury. Kayla Braxton spoke to Cathy Kelley regarding AOP, and noted that rumors are rife pertaining to Akam recovering from his knee surgery, and AOP potentially returning to the ring sooner rather than later. Furthermore, Braxton explained that there is also the possibility of AOP being drafted to SmackDown Live, when Akam recovers from his knee surgery. One ought to note that Akam's knee surgery, which took place around January of this year, could possibly keep him out for 3 months or more, depending on the severity of the injury. 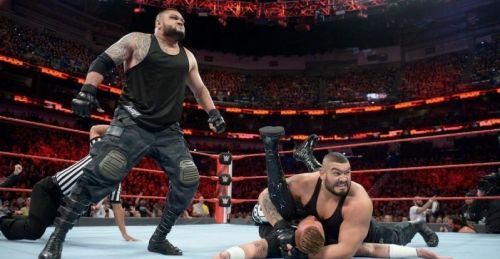 The general consensus in the professional wrestling industry is that AOP are likely to continue being utilized as monster heels in the tag team division upon their on-screen comeback. Also Read: WWE News: WWE Superstar speaks up for Sasha Banks, praises "The Legit Boss"
Would you like to see AOP return on RAW or SmackDown? Sound off in the comments!